Polish Chief Rabbi Threatens to Resign Over Shehitah Ban in Poland – 1936 or 2013? The Polish parliament recently re-affirmed a bill banning kosher slaughter (shehitah). The Chief Rabbi of Poland, Michael Schudrich, has said he will resign if shehitah is not legalized in Poland. This is not the only time ritual slaughter has been under attack in Poland. In February 1936, a bill designed to end shehitah in Poland was introduced in the Polish Sejm (lower house of the senate). It was modeled on a Nazi sponsored anti-shehitah law passed in Bavaria in 1930, which required animals to be stunned before slaughter. 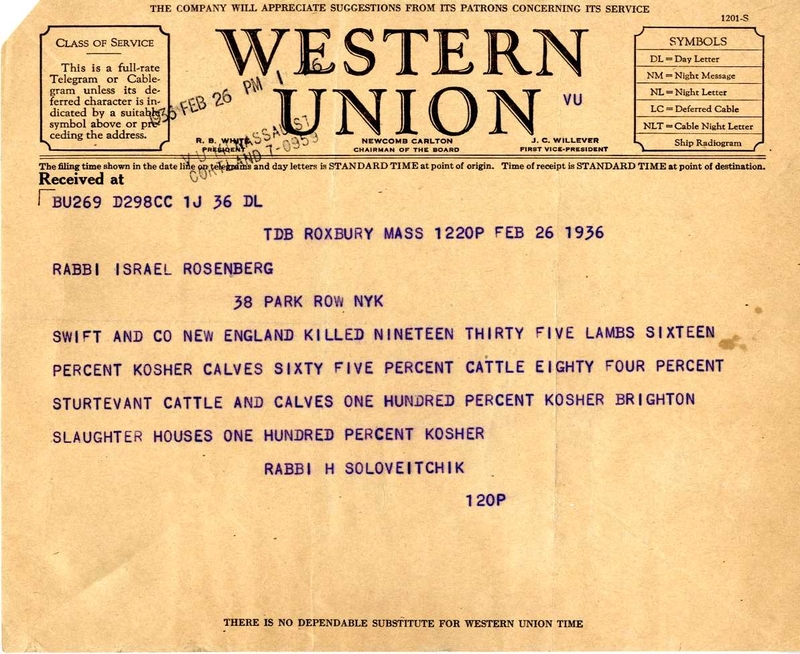 Rabbi Isaac Rubinstein, a rabbi in Vilna and member of the Polish Sejm, immediately cabled the Central Relief Committee (CRC) for statistical information on shehitah in the United States, data he thought could strengthen the case to defend ritual slaughter in Poland. 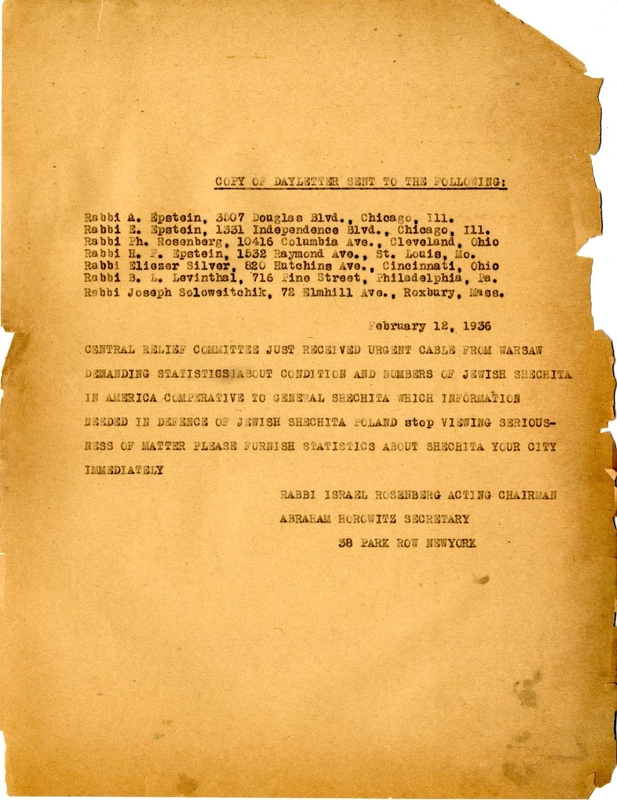 The CRC, the Orthodox arm of the American Jewish Joint Distribution Committee, was well-known to rabbis in Eastern Europe for the aid it provided to yeshivot. 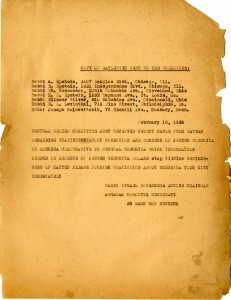 Rabbis Israel Rosenberg and Abraham Horowitz of the CRC wired telegrams to rabbis in sixteen communities across the United States for the relevant figures. 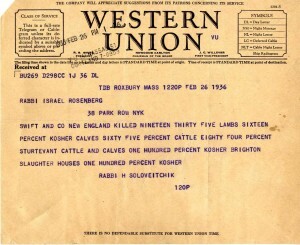 One of the telegrams was addressed to Rabbi Joseph Soloveitchik of Roxbury, MA, though the telegram in response records Rabbi H. Soloveitchik. Despite these efforts, the Polish law entitled “the Law Concerning the Slaughtering of Domestic Animals in Slaughterhouses” was adopted on April 17, 1936. Animals were to be stunned, with the exception of a provision for shehitah, in proportion to the population which required it. In areas which were less than 3% Jewish, shehitah was illegal. 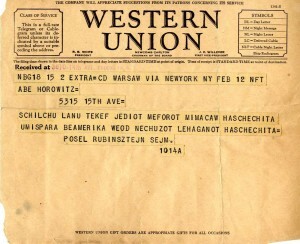 A blanket law prohibiting shehitah in Poland was passed on March 22, 1939, in the Sejm, but was still pending in the upper Senate when World War II broke out. Poland was invaded by the Nazis who unilaterally prohibited shehitah. Rabbi Isaac Rubinstein left Poland in 1941 for the United States. He was awarded an honorary doctorate by Yeshiva College in 1944, at Dr. Samuel Belkin’s inauguration as President of Yeshiva College. 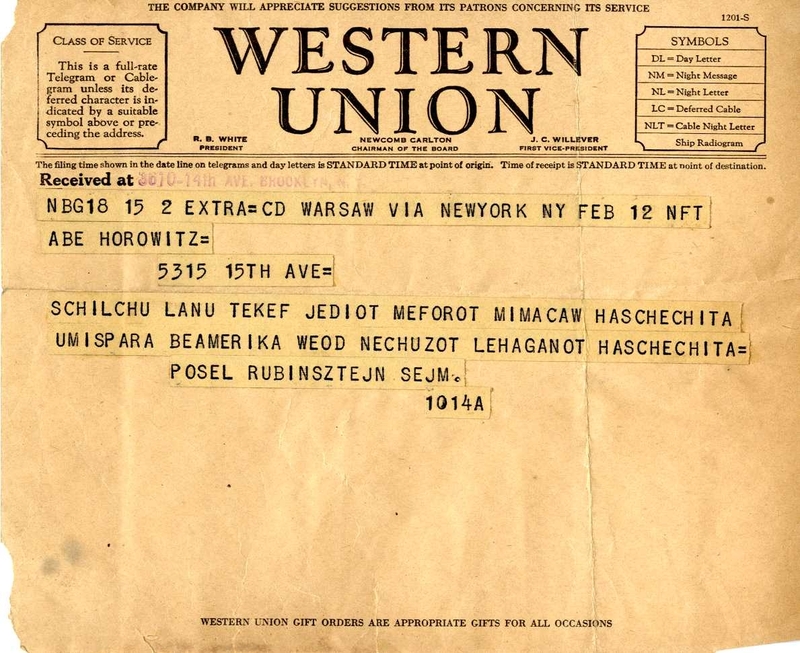 The correspondence of the CRC is housed in 299 boxes in the Yeshiva University Archives. For more information on the history of shehitah legislation, see: Religious Freedom: the right to practice Shehitah (Kosher Slaughtering) / by Isaac Lewin, Michael L. Munk, Jeremiah J. Berman. New York: Research Institute for Post-War Problems of Religious Jewry, 1946.